Google has a tendency to give less weight to dynamic urls than static ones. That means if google sees a .php extension or ?article=123, it will not rank as high as a url which has keywords in it and is a static permanent link. WordPress, by default uses dynamic links and therefore is not SEO friendly. Fortunately, it’s easy to change the links. In the newer versions of WordPress, all you need to do is go to the settings button in the wordpress admin and click on permalinks. Before doing this, you should think about whether or not you have old links which you want to redirect. If there are old links cached by Google, you will need to use a redirect plugin in order to prevent duplicate content issues. Scott Yang has developed a WordPress plug which is available on his site to do the redirects based on regular expressions. If you don’t have these kind of links, then all you need to do is log in to the wordpress admin and click on settings. Go to “Custom Structure” and enter /%category%/%postname%/ and click save. This will change all of your links to your posts to a seo friendly format. Make sure that your categories for posts are keyword relevant. Most people don’t know the sordid history of automated query tools with Google. 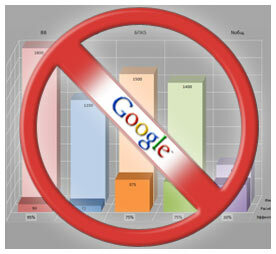 By the way, it isn’t just web position gold.Â It seems that every rank checking tool out there has been affected by this.Â There’s a number of people who think it’s silly for Google to be blocking access to rank checkers.Â But I’m pretty sure I know why they are doing it now.Â Rank Checkers have a huge impact on “impressions” and skew the search data significantly.Â As Google uses this data more and more, they have a strong motivation to make sure their impression data is more accurate for search results. Reputation management is not the most well-defined term in the industry.Â What exactly does it mean?Â How does one do reputation management?Â The fact is that a lot of SEO’s don’t even know what to do until an incident happens. 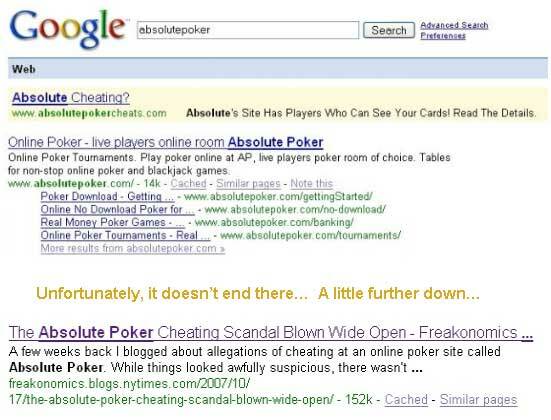 It’s not until you’re in a situation where someone is attacking your honor where you realize that Google has a lot of power over what others think of you and your company.Â Here is an example one company, absolutepoker.com which literally got devastated by other a few people who were very mad at them.Â They decided to advertise under their name to get top placement for their absolutepokercheats.com site and the following is what happened. Many people that manage Pay per click campaigns are aware that Google’s content network has a significantly lower quality of conversions than their ads.Â However, most people don’t know that the reason for it is because that is where the majority of click-fraud occurs.Â If you do manage a Pay-per-click campaign, you’re better off targetting specific sites or avoiding the content network altogether.Â You want to have control over which sites your ad displays on because very often the quality of the sites can be quite low. One of the biggest problems with the SEO world is that anyone can claim to be an SEO expert.Â It’s very difficult for someone interested in SEO services to figure out who is really an expert at SEO and who is just good at selling.Â Very often, people choose SEO companies based on reputation, but many companies can develop a strong reputation and still be awful at SEO.Â Often, the older, largerÂ companies simply rely on their online presence to get new customers, but are serviced by people who know very little about Search Engine Optimization. The truth is that many online businesses can truly benefit from great SEO, but after being burned by cheaper vendors promising wild guarantees and overcharging with very little results, most people are reluctant to continue with SEO. Our goal is to blow away misconceptions in the SEO industry, guide people to better ranking, and when you’re ready to take your online marketing to the next level give you the information you need so we canÂ get you there. Enter your information to get a FREE paper on Search Behavior! Olley D.: Thanks for writing this great blog I really enjoyed. muttertagsgeschenk: Good informations, keep up the good work. Wilden: Nice blog and thanks for the post! Houston search engine optimization: Blog provides great amount of information on concerts SEO, Which is good!!! Gloria: This is the direction the entire economy is going, better jump on in now. To inquire about our professional search engine optimization services (Search Engine Marketing, SEO, Search Engine Placement, Search Engine Submission, Search Engine Ranking, Search Engine Positioning, Conversion Analysis, Internet Marketing, Website Promotion, Web Design Services) or request more information, please email us at sales@yellowSEO.com or call (212) 868-1421. Copyright © 2008 Yellow SEO Search Engine Optimization Marketing Services - Performance Based SEO, Link Building, Web Design, & Search Engine Positioning. All rights reserved.